Ancient Civilizations - Ancient Egypt focuses on the following unit of study. Other units may supplement those listed here. The architecture, art, literature, music, philosophy, science, religion and political history of these eras will be included whenever possible. The Sphinx is an imaginary creature found in folk tales of many ancient peoples. Egyptian sphinxes combined the body of a beast, usually a lion, with the head of the ruling pharaoh. The most famous sphinx guards the great pyramid of Khafre at Giza. The sphinx's nose is missing because it was used by soldiers for target practice. The ancient Egyptians believed in many gods. 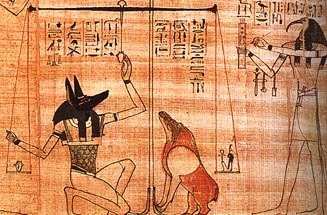 Some gods were represented with the heads of animals tht were considered sacred by the Egyptians. Osiris, the god of the afterlife, was married to Isis, the goddess of female fertility. Horus was their son. Anubis escorted the dead to the afterworld. Re (not pictured) was the Sun god. 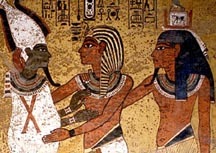 while Tut's spirit (right) looks on. From a wall of Tutankhamun's burial tomb. The ancient Egyptians used picture-signs instead of letters. Later, these signs became hieroglyphics - marks that stood for people, things, and ideas. Egyptian hieroglyphics were sometimes written from right to left; sometimes from left to right. When the Egytian empire died out, the secret of reading the hieroglphs was lost. In 1799, the Rosetta Stone containing two known languages and also hieroglyphics, was discovered. By comparing the languages with the hieroglyphs, experts were able to translate the signs.